Nemertes data shows some companies can cut operational costs in half with the use of performance management tools. As a technology researcher and advisor, data -- and its associated analysis and synthesis -- provides solid ground for technology recommendations. We speculate and make predictions for emerging technologies (for which the data is limited), and the prognosis for aging technologies. But data truly does speak volumes for some technologies. One data correlation that has been consistent year after year is the role of unified communications and collaboration management and monitoring tools in reducing operational costs. Again in Nemertes' 2017 UCC Total Cost of Operations research of 723 organizations, we found companies that use such tools have lower operational costs. 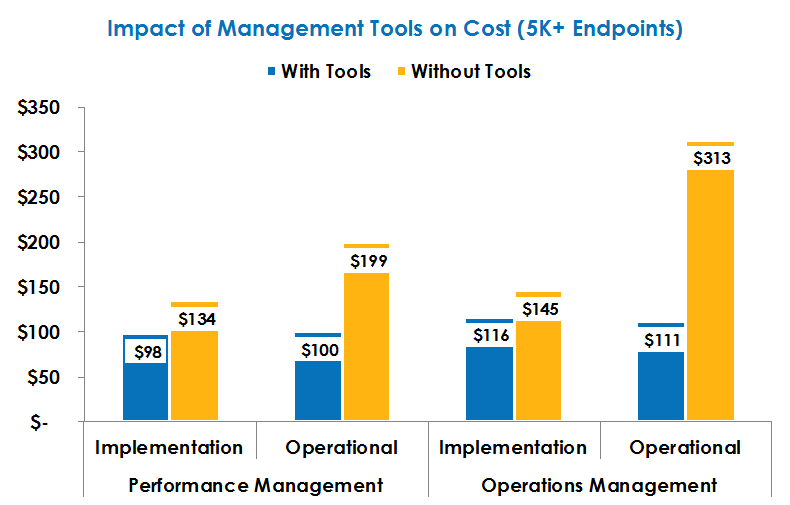 Operational costs drop by more than 50% with performance management tools, and more than 67% with operational/administration tools (see below for definitions) among companies with more than 5,000 endpoints. The actual reduction varies based on the size of the rollout and the provider. Companies can drastically reduce staff time and cost associated with managing UCC when they've adopted automated functions such as those that speed awareness, root-cause analysis, and resolution of problems. As a result, we recommend midsize-to-large organizations evaluate and select UCC management tools as early as possible in a UCC rollout or upgrade. Which type of tool and which provider vary based on each organization's architecture, size, internal expertise, and other requirements. Platform/cloud provider tools -- These come as a part of the platform purchase from providers such as Avaya, Cisco, Mitel, and ShoreTel, and from cloud providers such as AT&T, RingCentral, Verizon, etc. In our research project, 42.6% used these tools. Performance management tools -- These come from third-party specialists that focus on performance and event monitoring, root-cause analysis, fault management, and more. Providers in this space include IR, Riverbed, Event Zero, Unify Square, and others. Some, such as IR and Riverbed, manage multiple platforms; others, such as Unify Square and Event Zero, manage a single vendor (in their case, Microsoft). In our research project, 22.7% used these tools. Operations/administration tools -- These also come from third-party specialists that focus on system administration, configuration management, and provisioning, among other things. Providers include Unimax, Voss, and Riverbed, as well as some smaller regional players. In our research, 28.8% used these tools. Some of the lines are blurring between the provider types. For example, Voss is beginning to offer performance management functions, through its partnership with LayerX. Riverbed has consolidated its performance and operations/administration functions into a broad UCC management offering, though organizations may only use either performance or operations/administration management. Other tools, such as device management (i.e., headsets management, such as that from Plantronics, or handset management from Polycom) and network management (i.e., Solar Winds, EMC, HP, etc.) also help to manage UCC. But for this project, we gathered specific cost data on the three called out above. In all types of tools, organizations are leveraging reporting, analytics, and auditing functions. They're also implementing various self-service capabilities to put more power into the hands of employees, requiring less IT staff time for simple functions such as resetting passwords, call forwarding, and availability notification. In addition to cost savings, companies that use management tools see higher UCC adoption. Makes sense, right? If the technology works well, people will use it. For example, performance management users with 2,500 or more UCC endpoints have 30% more employees with UCC licenses. I've made the case to consider management tools, based on the associated reduction in operational costs. In addition, Nemertes has developed a Business Value Matrix to give IT leaders yet another set of decision criteria as they narrow down their providers under consideration. The Y-axis plots the average annual UCC operational cost associated with each provider. Thus, those in the top right have the highest rating and the lowest associated UCC operational cost. Bottom line: Evaluate and include in your UCC budget a line item for management tools, particularly if you have more than 2,500 endpoints. That's when the savings is most significant. The most successful organizations use a combination of the types of management tools, since they typically handle different capabilities. Leverage research data, such as that which is presented here, to help with your decision-making. Regarding the Business Value Matrix: If both high ratings and low cost are crucial, look to the top right. If customer rating is most crucial, look at the right side of the matrix. If cost is most important, look at the top of the matrix. Then select a provider or providers, and automate as many functions as possible, reducing staff time required to maintain an efficient UCC environment.